The BuzzzMaster allows you the freedom to warm up anywhere...without having to use your instrument. It is the perfect tool to help you target in and focus on your air stream, wind power and tongue placement, plus maintain proper embouchure formation to maximize your buzz for pinpoint accuracy. Manufactured in the USA by David O'Neill. The BuzzzMaster is a must-have tool to keep the buzz in your chops fresh and ready at all times. Unlike using your mouthpiece alone, or with other similar products, the BuzzzMaster design provides resistance just the same as your instrument does. The Trumpet and French Horn models are externally identical, however, each is internally sized to fit their respective mouthpieces. Most Euphoniums, other than Wilson and older Boosey & Hawkes, have the Symphony Tenor/Bass shank (our "B" designation). A constant challenge in my daily need to maintain chops is practice either side of daily performance! Having a young family and other distractions mean it isn't always easy to get time on the instrument when needing to maintain them! Enter stage left, the BUZZZMASTER, which is a fantastic piece of kit for preparing the lip for performance and warming down on the way home! The resistance that it offers is just like having the mouthpiece in the trumpet. 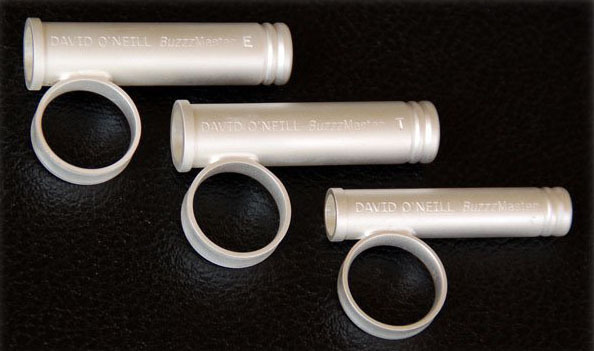 I have been using the BuzzzMaster regularly since I received it and feel it is a very valuable tool that would be useful for any brass player. I like the resistance that the BuzzzMaster provides when warming up or rewarming up after a long rest period on stage or off stage. I don't recommend buzzing an open mouthpiece due to the fact it opens the aperture up too much, but buzzing with the BuzzzMaster works great. David O'Neill popped by my studio this afternoon with one of his BuzzzMasters to try. I really like this! It is a precision-made mouthpiece buzzing device that has a unique end which creates a resistance like actually playing the trumpet. I can play softly or loudly with the same lip exertion and breath support that I use when playing the trumpet. My lips don't tire too quickly and I do not have to play with more effort than I do when playing the horn. It sounds softer than buzzing the mouthpiece by itself, too. I can see using it in hotel rooms or backstage without making too much noise. If you are into mouthpiece buzzing you should definitely check it out. The BuzzzMaster enables me to warm up with an efficiency and accuracy far beyond my expectations. It is the perfect companion to my daily routine. After having spent the past couple of weeks with David O'Neill's BuzzzMaster, I can say without question that you have another WINNER. As a tuba player, I am a big believer in mouthpiece buzzing for eartraining, wind, and obviously embouchure development. There are many fine products on the market to help with buzzing and they all work well, however, I think BuzzzMaster is the only one the gives me the actual feel of the tuba while still keeping me honest with note placement/accuracy. I will recommend this to all of my students and certainly mention its benefits in clinics and master classes! Since being introduced to the BuzzzMaster by David O'Neill, I have integrated it into my daily routine. Unlike other buzzing tools, the BuzzzMaster only allows you to buzz in a register that is optimal for warming up, and will not cause undue tension before a long days work! I recommend this as an invaluable tool for ALL horn players.